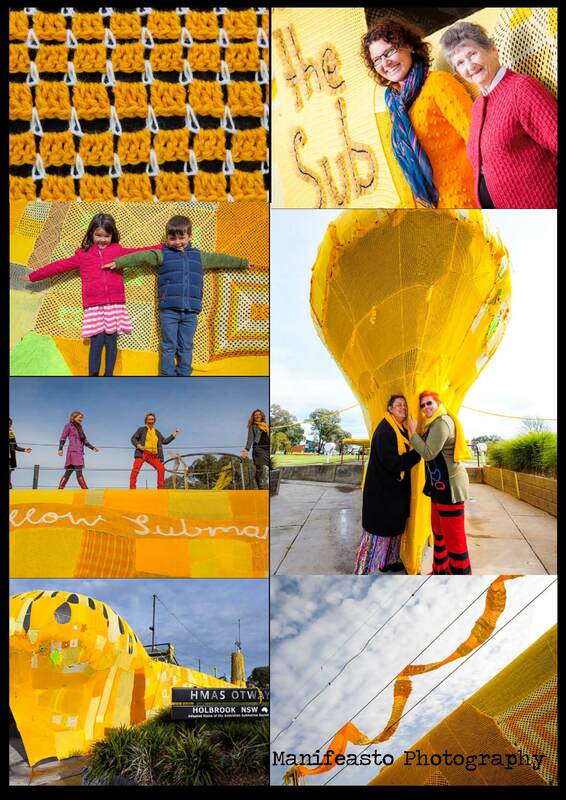 I was so excited to be engaged by Murray Arts to photograph the launch of the Holbrook Yellow Submarine today. After months of planning, knitting, croqueting, pom-pom-ing and any other method of turning wool into something beautiful, the HMAS Otway at Holbrook, NSW was yarn-bombed with yellow wool to celebrate the 50th anniversary of The Beatles tour to Australia as well as encouraging tourists to Holbrook, the town which was the last to be by-passed on The Hume Highway. Hundreds of people from around the world- yes the world- contributed piles of yellow creations to cover the sub. Young and old, expert knitters and novices all had a go- me included! It was lovely to walk around the 90 metre-long submarine inspecting all the pieces. I was overwhelmed at just how much wool, effort and enthusiasm was brought together in this small NSW town. Hundreds of people as well as media from near and far came to the launch and the children from Holbrook Primary stood aboard the sub and sang ‘Yellow Submarine’ (what other song would it be?!). Thanks to all the artists, contributors and supporters who came together (nearly another Beatles song there;) to make this dream a reality. Keep an eye of the Murray Arts website and the Yellow Sub Facebook page to see more of Manifeasto Photography’s photos from the day.